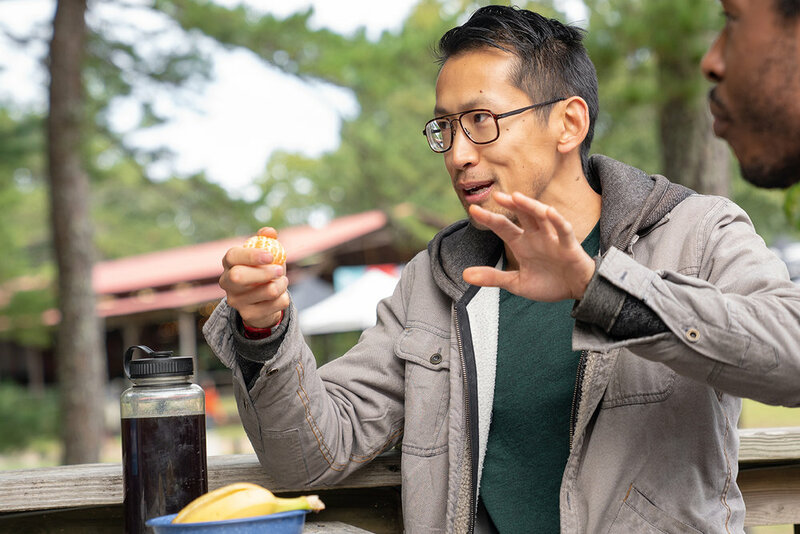 In October 2018, the Color the Crag climbing festival took place at Horse Pens 40, Alabama on Cherokee, Chickasaw, and Creek Territories. For those unfamiliar, the festival celebrates diversity in climbing, and addresses a key barrier to the sport: lack of community. 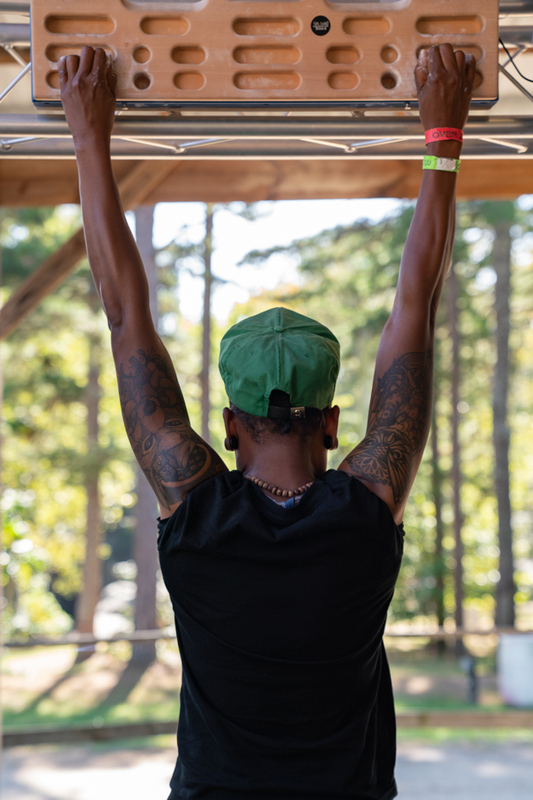 Already in its second year, the event brings together climbers of all backgrounds and was founded by Brown Girls Climb and Brothers of Climbing. Color the Crag was an impactful event for many reasons. One crucial part was that it brought together some incredibly talented and wise coaches of color. Experienced climbers like Oakland based coach Emily Taylor and Abby Dione, the owner of Coral Cliffs taught climbers how to move and how to flow across the rock. Although this was my first time attending, the event reminded me why having coaches and mentors that look like you matters, and why athlete representation is not enough. 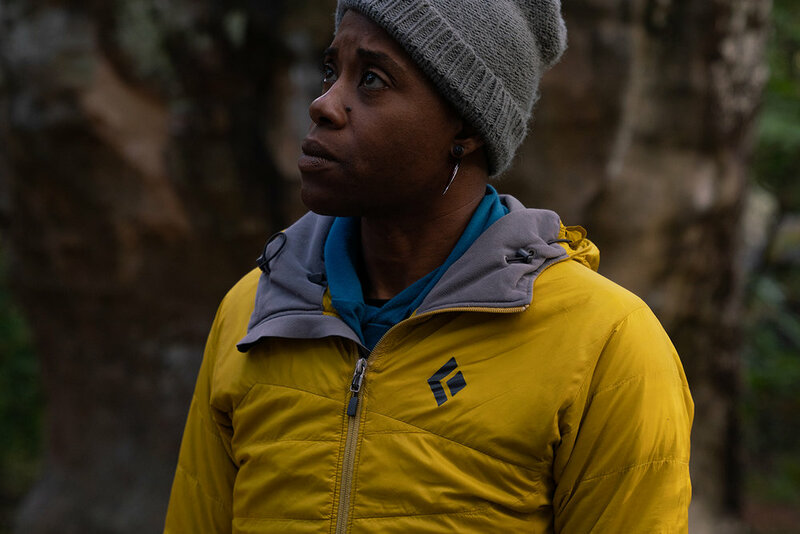 Dismantling barriers that limit the participation of people of color in the outdoors must also involve substantial investment in the people who will mentor the generations to come. Many writers have tackled the importance of finding familiar folx who look and sound like you. Many more have written about the difficulty of being the only one in environments where whiteness is normalized and brown skin is not. Color the Crag was truly an immersive experience where I was surrounded by a diverse community of climbers and coaches. Even though the event was just a few days long, the intentionally diverse space allowed me to feel completely supported. The comfort I felt made it easier to try new things and make mistakes. I can still feel and hear the strong encouragement and beta from Emily Taylor, a highly trusted coach within the climbing community whose nearly three decades of experience dwarf my own. On one of my last climbs of the day, Taylor’s words enveloped me and pushed me forward, giving me the kind of courage that I hadn’t felt since I was a child hearing my dad yell at me to go faster or pick myself up after a harsh tackle. So what does this mean for the outdoor community? In part, it means that there needs to be more investment in diverse coaching and guides—investing in diverse athletes is not enough. Teach one, reach one, is a common saying within brown communities and Color the Crag would not have been complete without its teachers. 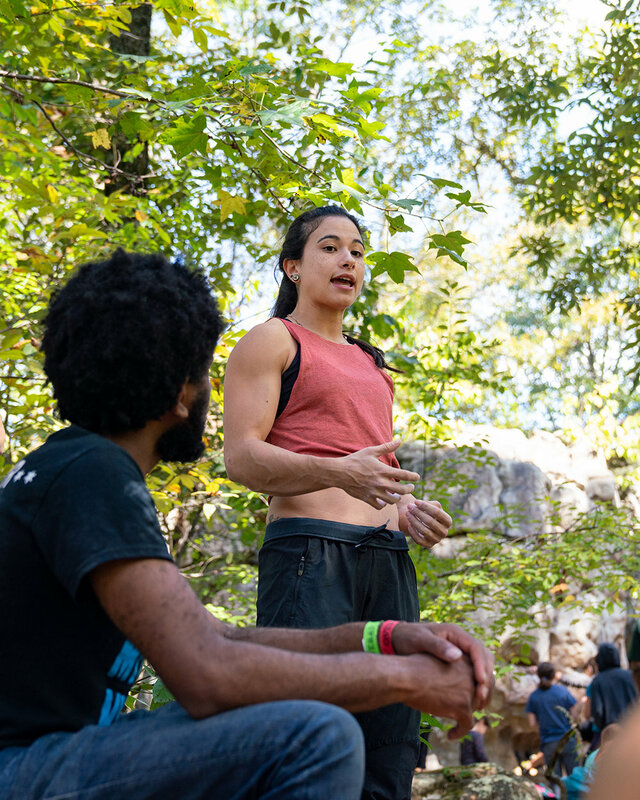 I had so many favorite moments but a few come to mind: listening to the clinic leaders give beta, watching pro climber Nina Williams talk about her own injuries, or listening to coach Abby Dione’s insightful beta for shorter climbers. Yet another great climbing coach, Abby Dione, owner of Coral Cliffs Climbing Gym, starts the clinic off with smiles. Photo: Michael A. Estrada. 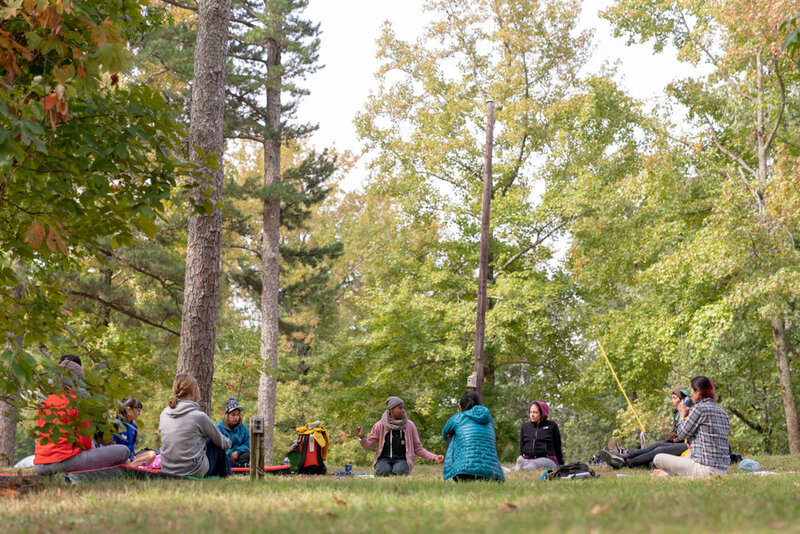 As Shelma Jun, Flash Foxy founder and one of the SPI course attendees, writes in The Future of Mountain Guiding is Women, the value of having an all-women crew was comfort, inspiration and power. Within the safe space of the group, the participants were able to flourish without feeling the need to prove themselves to a group of men, without fearing the consequences of being vulnerable in a mixed space. The all-female SPI course stands as a shining example of what it means to invest in training the next generation of coaches so that their future students might feel just as comfortable, valued, and cared for. Whether it’s a course featuring all women attendees and instructors or a space for people of color—or frankly even a mix—diverse coaching representation matters. It provides participants with emotional safety and trust that simply cannot be replicated any other way. For true and lasting change to occur, these events need to become the norm and they must be free to attend. The investment goes beyond the marketing strategy of a single brand. Investing in coaches, mentors and guides who will nurture the generations to come is essential because they will also serve as our storytellers and the keepers of our collective lore. From media creation to clinic hosting, the makers and the teachers need to reflect their audience: if our kids are to be nurtured properly in a sport, they should be taught by people who look like them, too. If Indigenous stories are told, let the storytellers and photographers be Indigenous themselves. If I hear a brand or organization say one more time, “but there aren’t enough!” my answer is this: pull out your wallet and invest in training. Bridge the education gap and intentionally make the effort to develop leaders so that one day there are both diverse coaches and athletes at every track, crag, and field.